Nestled in one of the most premium addresses of the country, Jubilee Hills, Hyderabad stood a half-built project that was in desperate need of a jumpstart. Since the house wasn’t shaping up as per the client’s wish, they decided to hit the reset button. The project was handed over to Rohit Suraj, principal architect of Urban Zen, who was asked to step in and redeem not just the half-built structure but also the client’s hope for that perfect dream home. 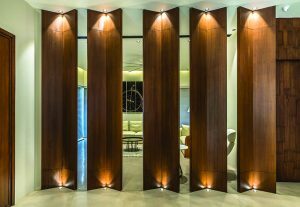 Rohit’s work at Urban Zen has always been about “instilling fascination, elevating the human spirit and initiating conversations”, and this was just what these particular clients needed. During the first visit, the architect found that the house was on stilts and the living (first) floor was disconnected from the landscape. “Most of the structure was post tensioned slabs and beams, therefore, it became pertinent to develop a skin around it that completed the facade and gave the elevation its desired appeal and finesse,” he says, adding that they decided to reposition and repurpose the rooms to create the final agglomeration of spaces that were at par with the client’s perspective. The site itself possessed a serene aura that seemed to beckon a nature-centric design approach. 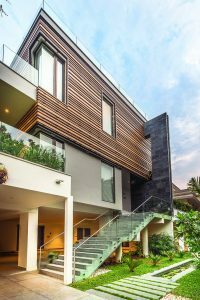 The warm and inviting House of Tropics is reminiscent of a farmhouse, albeit in a contemporary and progressive manner that avoids cliche farmhouse facade treatments. 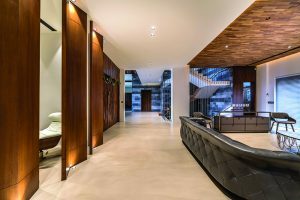 Turns out, the clients too desired a residence that would have a farmhouse appeal, albeit in the most modern way possible with the feeling of warmth and intimacy being the defining factor. A tropical theme was settled upon. “Bold and minimalist, this home is inspired by nature in the tropics and allows every space to interact with the outdoors. The design appeals to the modern connoisseur using the warmth of familiar materials that are timeless and classic. 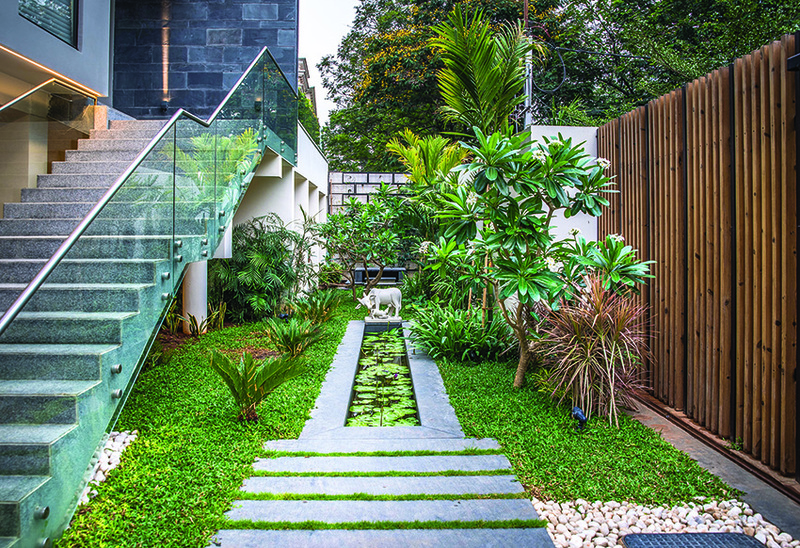 The home is kept spacious and wanting and is designed as a green haven in the midst of an urban jungle,” Rohit explains. Like trees reaching for the sun in a tropical forest, the structure rises above in its own pursuit for sunshine. The stilt level accommodates the home office along with a guest bedroom, multipurpose room and a couple of utility service spaces; and the living quarters with a family and drawing room, dining and kitchen, pooja room and master bedroom are strategically placed on the next level. “The ground floor of the house, with garden spaces all around, is lifted up from street level enabling a good flow of light into the home while giving it ample breathing room in the living area,” highlights the architect. Temple trees, low height palms, ferns and water plants like lotuses and water lilies bring the outdoors alive. The low height pool is edged with local grey granite stone and the serenity of Mother Nature is framed perfectly with a marble sculpture of a holy cow feeding her calf. 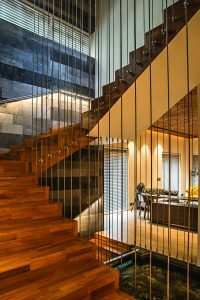 Inspired by the vertical perspective of trees in a forest, the staircase of the house, designed with metal wires in tension kept in place with small anchors on the side of each tread, occupies a prominent central location in the house. It leads you to the private scape above that includes three luxurious bedrooms. 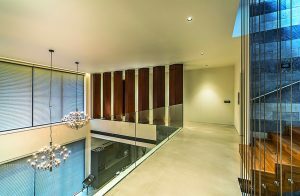 The final level, the terrace floor, heightens the luxury factor of the house with a home theatre, a swimming pool and deck, and an outdoor lounge. What’s most impressive about the home, architecturally, is that luxury is infused with warmth and simplicity. In the living area, an expansive family room, with a plain yet striking teak wood ceiling, opens up to the outdoors with each window framing the lush and dense landscape. The double-height dining area is another picture-perfect space, with two chandeliers that are intended to mimic starry nights and large glazed fenestrations that overlook the lotus pond and trees in the podium garden. 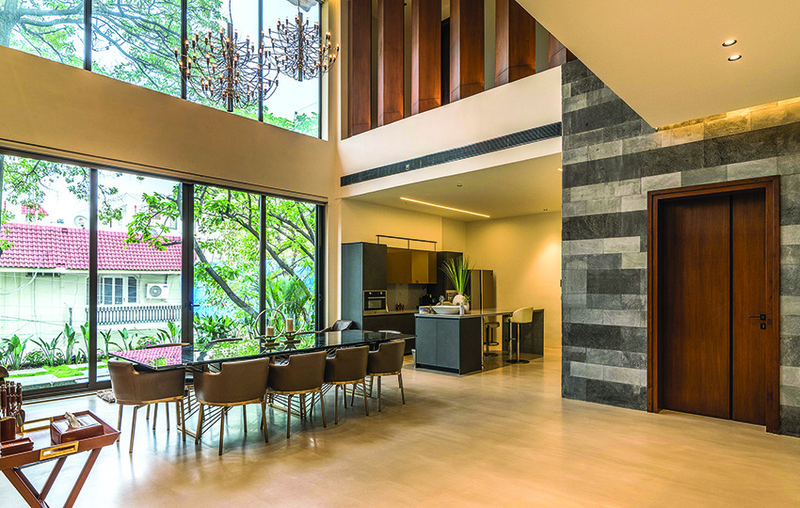 Grand as the dining may be, it is given an homely extension by the attached open kitchen that seems like the perfect nook for conversations over breakfast. A closed, wet kitchen hides the more elaborate (and often messy) process of cooking regular meals. Each level enjoys its own outdoor area as seen in the semi-private retiring space at the first level. By using natural teak over the ceiling, the design maintains the farmhouse vibe indoors as well. The bedrooms are cocoons of comfort despite being generously proportioned with large walk-in closets and luxurious bathrooms. The focus is maintained on natural materials and each room builds on the farmhouse theme with its own distinctive, contemporary appeal. 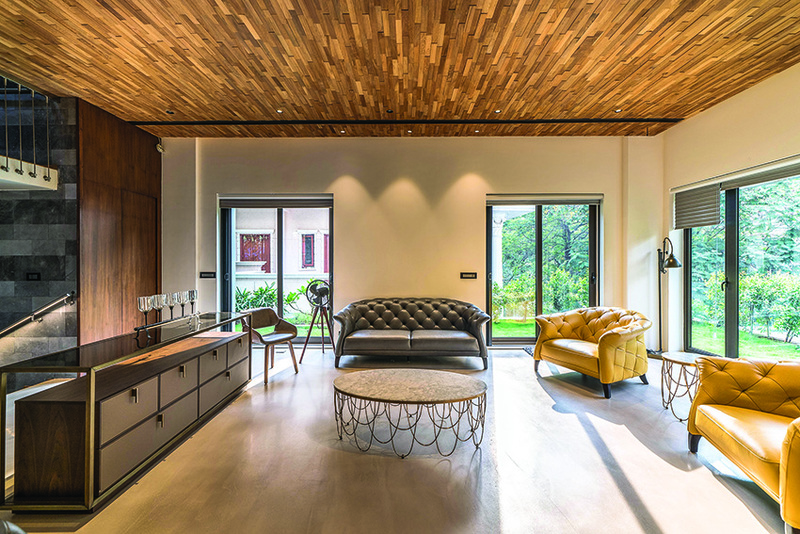 “Materials like rough-cut stone, heavy grained timber and bamboo have been used throughout the house to bring in the look and feel of the tropics,” points out Rohit. 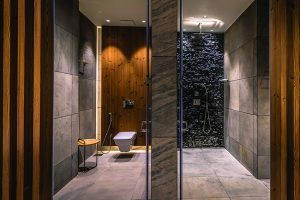 By juxtaposing stone with wood — seen as panelling over a headboard wall in a bedroom as well as in the bath suites — a modern-rustic design has been imbibed throughout the house. 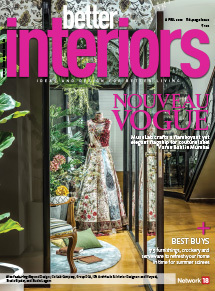 Of course, a tropical theme would be incomplete without a connection between the indoors and outdoors. This is something which the house maintains even at higher levels. It even informs the choice of plants: temple trees, low height palms, ferns and water plants like lotus and water lilies. Edged with local grey granite stone, the low height pool forms the central element of the garden, with stepping stones and white pebbles patches creating a variety of surfaces to look, feel and touch. At the entrance, knotted wooden planks blend with the garden on the inside. In order to impart the tropical theme to the dining area, the design intentionally included glazed walls that provide a clear view of the outside. Indoors, the innovative chandeliers create the feeling of dining under the stars. The grey wall cladding has been made with natural stone, staying true to the natural, rustic theme but with a sophisticated edge. On the outside, the farmhouse concept is reinterpreted with a palette of concrete, natural stone and wood. “They wanted to have a progressive facade treatment instead of establishing a stereotypical farmhouse appeal,” shares Rohit. The sleekness of the ponzio aluminium fenestrations blends seamlessly with the rustic planks that clad the second floor. 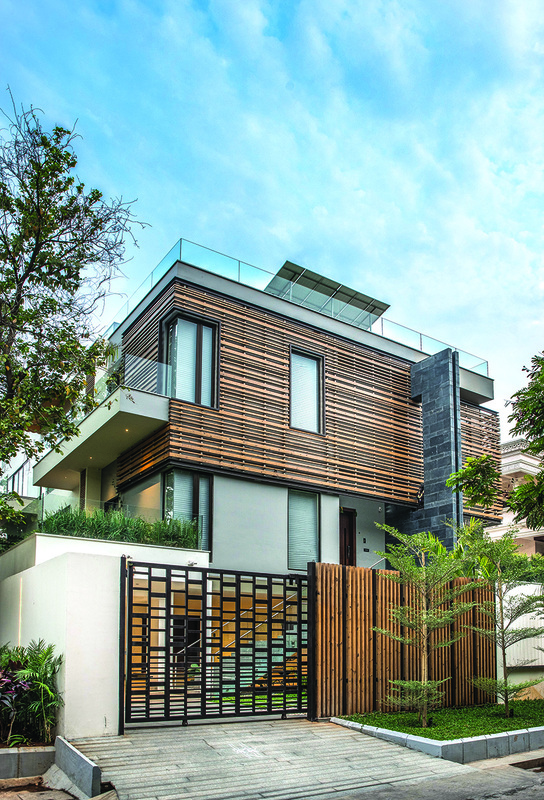 With clear skies as the perfect backdrop and the inherent greenery that the location is known for, the structure draws you with its aesthetics but looks just at home within the streetscape. Just the way tropical forests invite you with their serene environs, the House of Tropics, in all its grandeur, imbibes a similar warmth and peaceful quality. 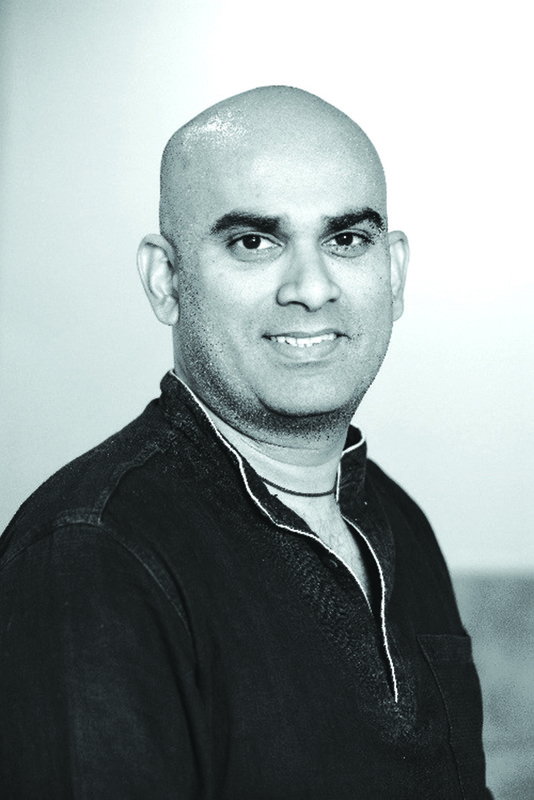 Even though they started with a half-built site, Rohit and his team at Urban Zen managed to make it their own. Glance through and you will see that it does instill fascination, elevate the human spirit and definitely initiates conversations! A home that would juxtapose the coziness of a farmhouse with a modern aesthetic and tropical vibe. The house is divided over three levels. It has parking for four cars in the stilt area, which also includes access to the home office, lounge and guest bedroom. The upper two levels host the main living areas, kitchen and dining and the private quarters of each family member. By lifting the house up from the street level, the living area — with the dining and kitchen at the far end — makes the most of the good flow of light while also enjoying ample breathing space. The furniture in the drawing room, as well as for most of the house, is largely sourced from Europe and the Far East by Home Affairs in Hyderabad. The folded wooden partitions in natural teak screen the drawing room from the rest of the living room on the first floor, providing both privacy and an aesthetic dimension to the space. The airy and light natural stone dining set is flanked by teak wood wall paneling on one side and overlooks a low height pool edged with local grey granite stone at the other. Stepping stones and white pebbles add an interesting nuance to the outdoor space. The design of the staircase of the house is inspired by the perspective of tree tops as seen in forests. It is composed of metal wires in tension kept in place with small anchors on the side of each tread. 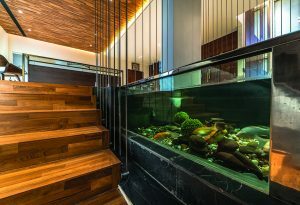 The indoor koi pond was added to resonate with the tropical theme of the entire design. The details of the staircase pair beautifully with the pool. 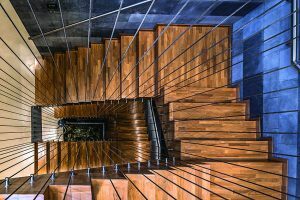 Both the variation of colour on the wooden parquet flooring in the staircase and the metal tension wires create an artistic interpretation of tall treetops. Major changes were carried out in the brickwork of the original layout, the most significant being the dining area. The ceiling was expunged to create an amplified double heighted volume — just as the client had always desired. 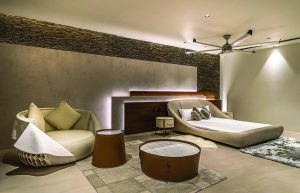 In the private quarters on the last level, the tropical theme has been illustrated through natural teak textured wall panelling. 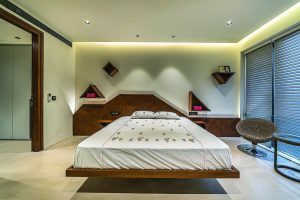 An air of simplicity is maintained by the linear form of the floating bed and the randomly juxtaposed shelves and side units. The combination of corbelled stone walls, wood panelling and cosy furnishings in natural colours create a cocoon of comfort in the master bedroom. The furniture was sourced by Hyderabad-based retailer, Home Affairs, from Europe and the Far East. 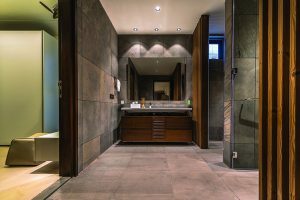 The wet and dry areas in the bath suites are not just separated but designed as individual spaces with complementary materials cladding the walls. Designed to flow naturally as an extension of the bedroom, the bath suites are havens of relaxation. Seen here is the large Bravat washbasin over a custom-built vanity unit with the WC and shower areas on the right.